pr88 Skin Protection Barrier Cream - Case Lot | pr88 / GAMP Inc.
pr88 is a water soluble barrier cream which when applied before work, provides a protective film that prevents harmful substances from making contact with your skin. The protective film can only be washed off with water. Upon completion of work the dirt is washed and rinsed off, together with the cream, under running water. Grease, oil, paints, varnish, soot, tar, silicone compounds, paints, lacquers, adhesives, polyurethane glues, UP-resins, epoxy resins, graphite, fiberglass, dirt, dust, and many more harmful substances. 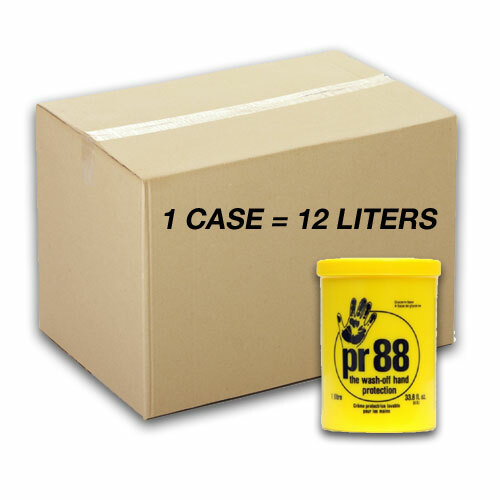 pr88 is a water soluble barrier cream, with a glycerin base, which when applied before work, gives effective protection against a wide variety of greases, oils, varnishes, paints, adhesives, fiberglass, tar, dyes, resins, inks, graphite, epoxies, gasoline, most solvents, etc. 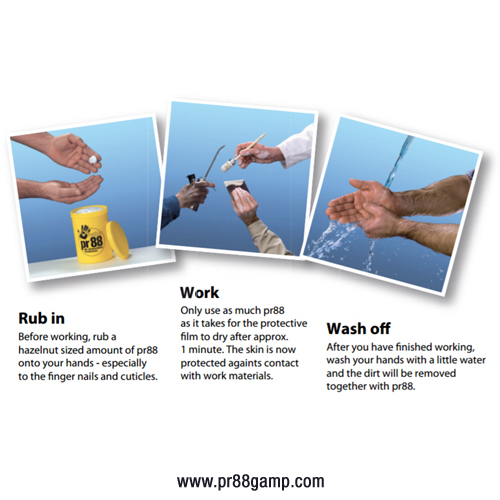 pr88 is not a hand cleaner or detergent, it provides a protective film that prevents harmful substances from making contact with your skin, while at the same time allowing the skin’s natural respiration process to be unaffected. The protective film can only be washed off with water. Upon completion of work the dirt is washed and rinsed off, together with the cream, under running water. pr88 helps to prevent the penetration of most non-aqueous contaminants that pose a problem to the skin. pr88 reduces skin damage from harsh cleansing practices because of the ease in which cleanups are accomplished when pr88 has been used and applied properly. It improves the user’s subjective and objective feeling of well-being by allowing him/her to have well groomed hands and skin, even after the conclusion of dirty work. 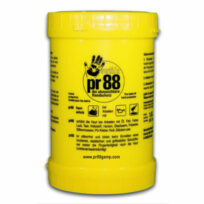 pr88 will not leave fingerprints or transfer to surfaces touched once it is properly set on the skin. (approx. 1 minute) “pr88” forms a dry, non-greasy protective film that prevent substances in question from coming in contact with the skin. 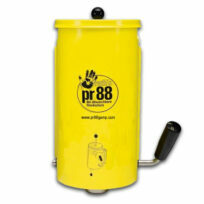 pr88 is environmentally safe, nontoxic, non-allergenic, biodegradable, and made with natural ingredients. Dermatologically tested, it contains no silicone and can safely be applied to various parts of the skin and even cuts, scratches, and scrapes. 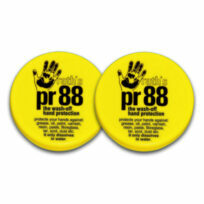 Before working, rub a hazelnut sized amount of pr88 onto your hands – especially to the finger nails and cuticles. 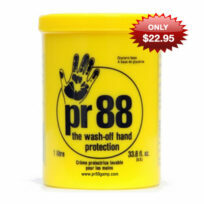 Only use as much pr88 as it takes for the protective fillm to dry after approx. 1 minute. The skin is now protected against contact with carbon based substances and will only come off with water. 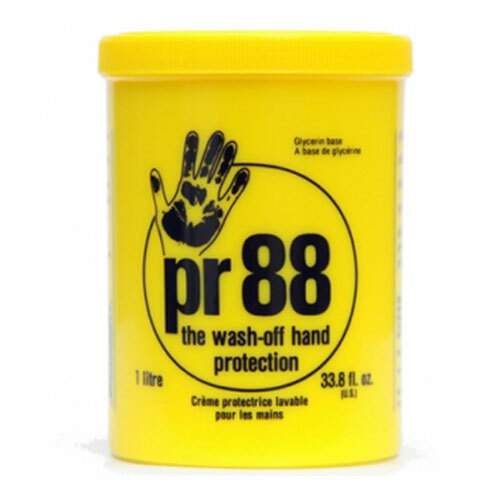 After you have applied pr88, and have ensured that you have carefully creamed between your fingers, the finger tips and cuticles, rub the rest into the skin with hand washing movements until it is completely dry.